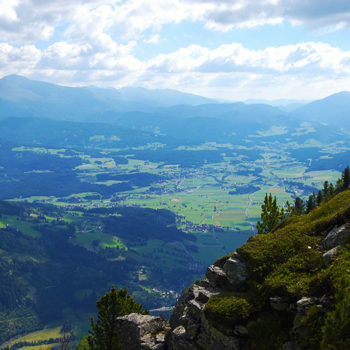 Austria offers an amazing variety of wandering- and hiking trails. 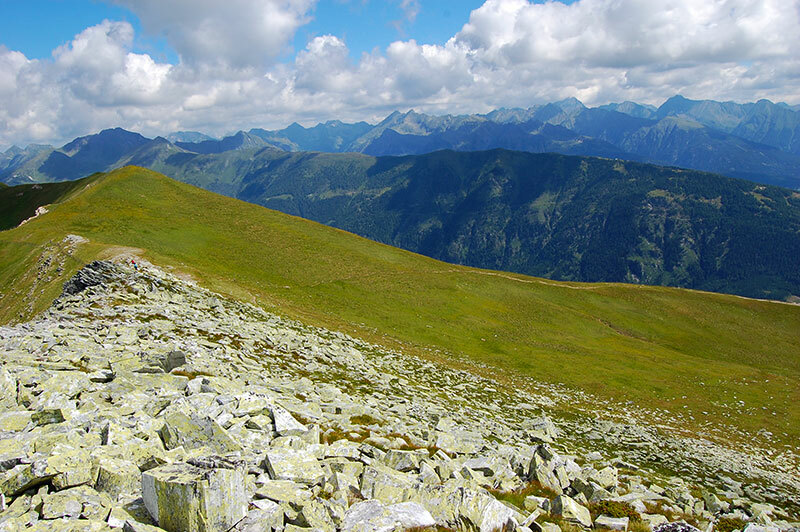 One of my favourites is the 4-hour hike to Speiereck at 2411 metres above sea level. 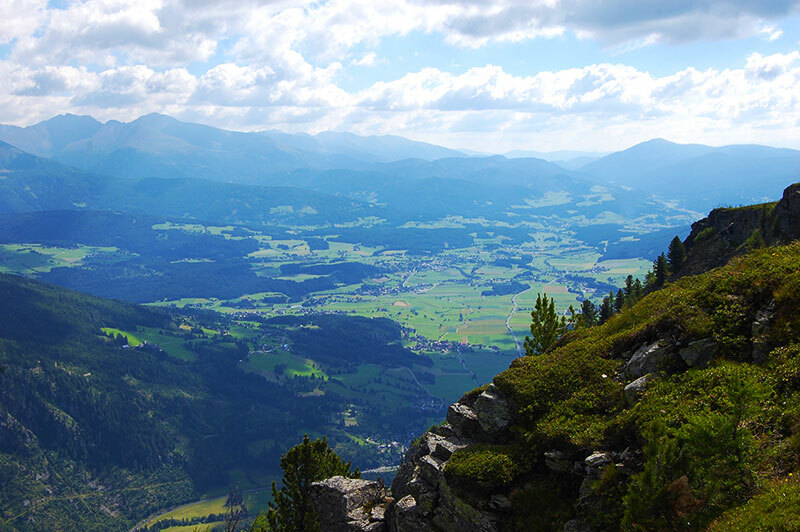 Obsessed with stunning views I love hiking in Austria. 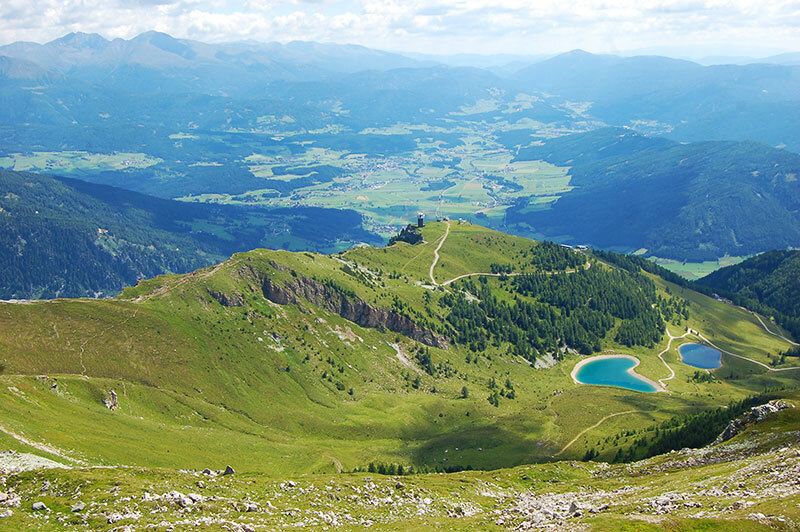 Add to that magnificent nature and crisp fresh air – well, then you have the recipe for a brilliant day out in the Austrian Alps. 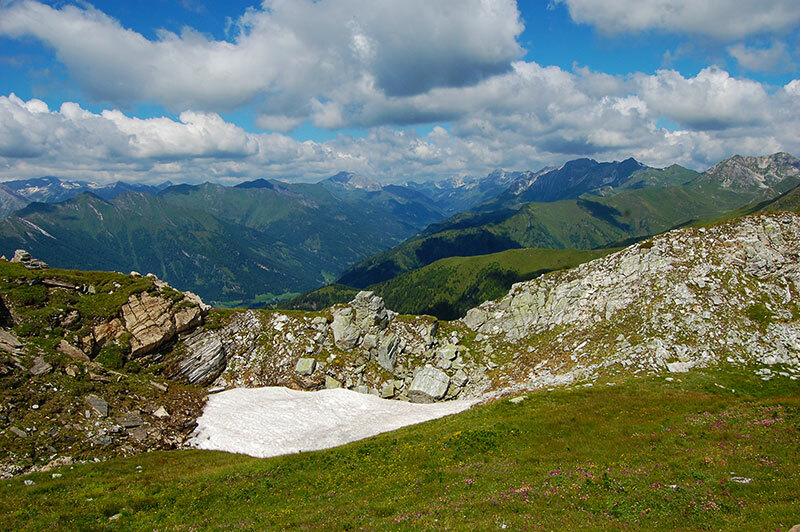 The Speierck (2411 m / 7919 ft) in the holiday region Lungau offers an easy to medium level half-day hike. Most trails start already in the valley, but I prefer to start above the treeline if possible. Just outside the historical village Mauterndorf you can pick up the cable car and travel comfortably up to Grosseck at 1960 metres / 6430 ft above sea level. This is a perfect start on this trip. There is still enough terrain and altitude left to get some exercise. 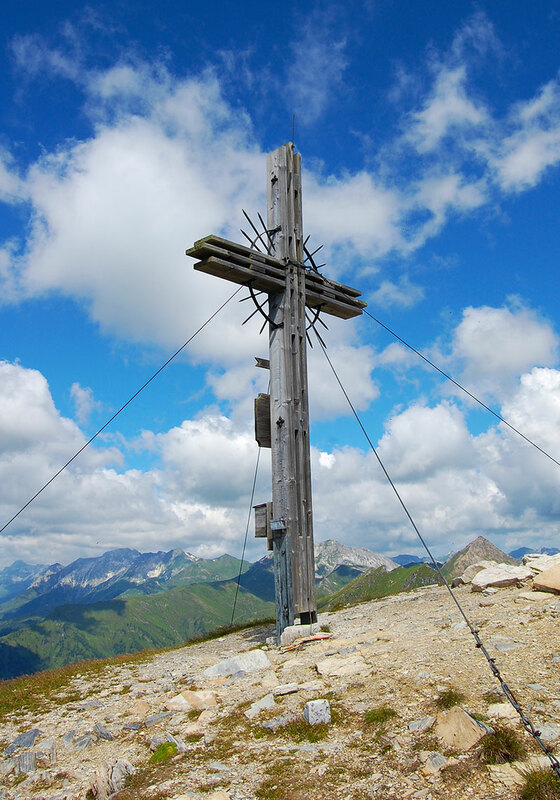 The hike up to Speierck and the back to the cable car station at Grosseck, takes about 4 hours at a normal pace. 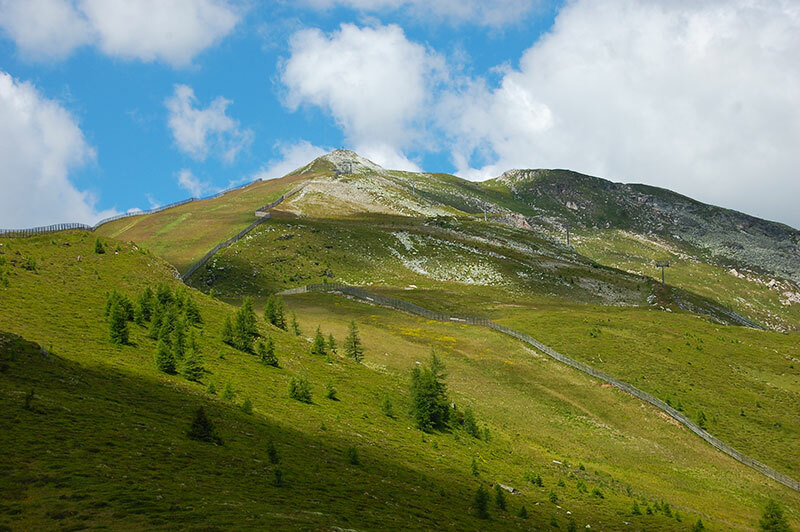 The most popular route takes you to the peak and back to the cable car station in a loop, so you don’t have to backtrack. Starting the hike, you follow a gravel road for about 20-25 minutes heading steadily upwards before you reach the ridge and Grosseck. 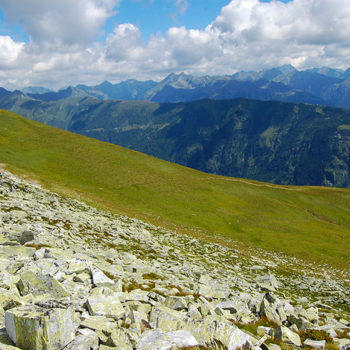 From the ridge, you already have spectacular views towards the east and the village Tamsweg. Continue following the trail along the ridge for a while. The east side of the ridge is almost vertical in some places. Stay off the edge of you are afraid of hights! The trail steadily gains altitude, but is by no means hard to hike. 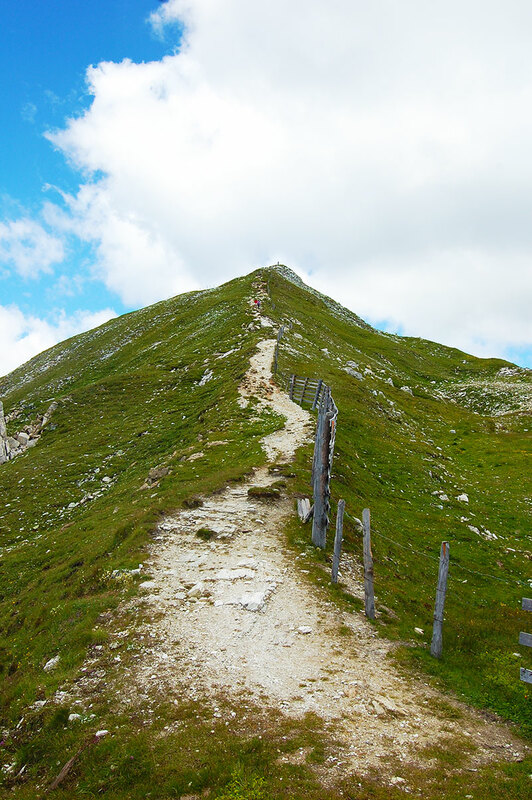 A great bonus is that for most of the hike, you can see the peak you’re aiming for. 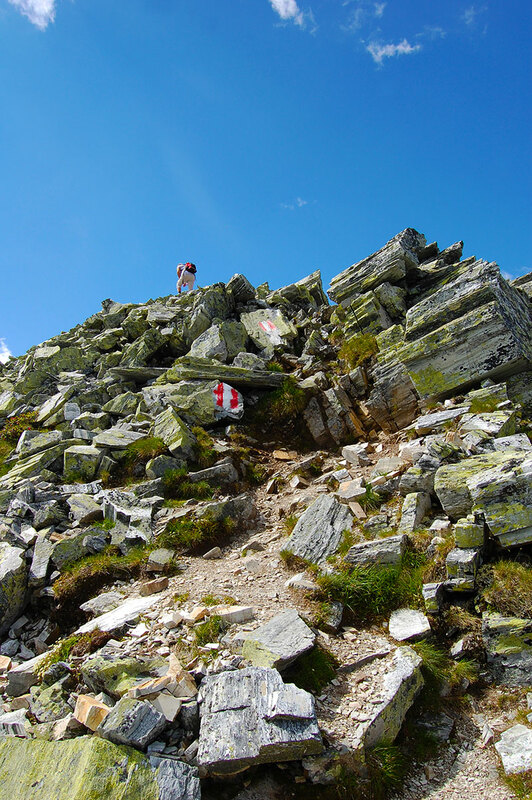 The hike to Speiereck is described as easy to medium difficult. 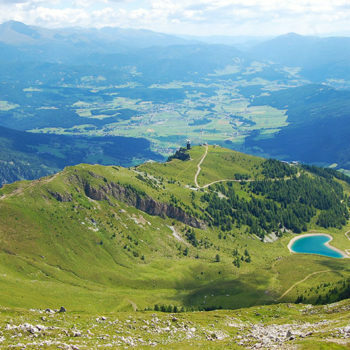 Most people do the hike anti clockwise, hiking up from east and descending on the ski slope, before returning to the cable car station via the lakes. 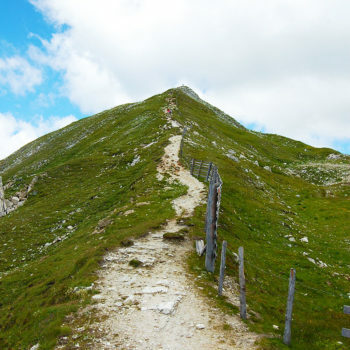 Even though you are hiking along a well-trodden path most of the way, except for a small stretch near the peak, you definitely need good boots for this hike. Sneakers or joggers are too instable, and hurting yourself up on any mountain is a rather bad idea. Thus, despite of the stunning views, keep an eye on where you put your feet. 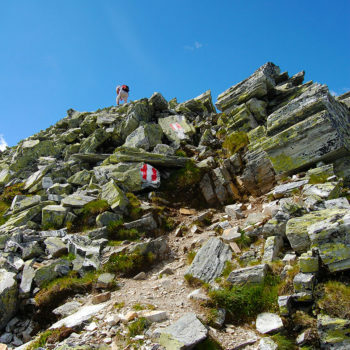 Almost at the peak, you need to traverse a steep incline with patch of rough rocks, maybe even using your hands to hold on. 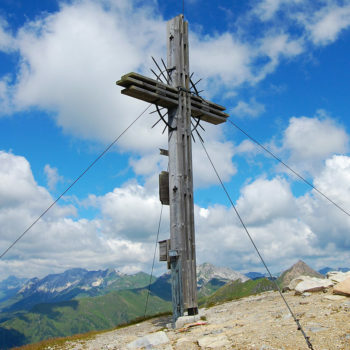 However, the last few hundred metres to the peak, with the cross in sight, are easy going. As always reaching the peak gives you a great sense of satisfaction. Sure, this isn’t Matterhorn nor K2, but adding another mountain peak to my hiking portfolio, is an personal achievement nonetheless. 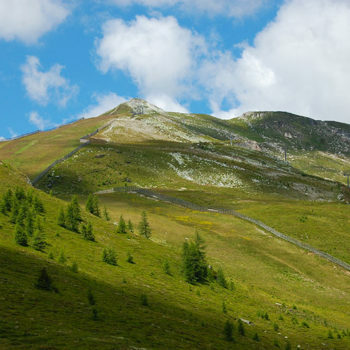 You’ll reach the peak after about 1 ½ – 2 hours depending of your fitness or how many photo stops you made along the way. After the obligatory selfie at the top cross, it’s time to enjoy the view. 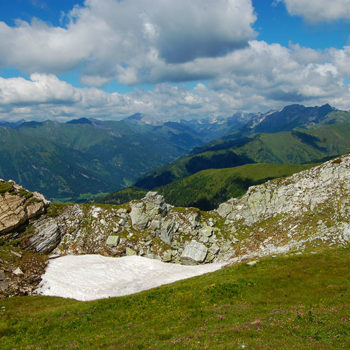 If the weather is good and the air is crisp, you easily have stunning views for 100 kilometres into the surrounds Alps. This is when you realise that you are just very tiny creature in this incredible landscape. I find that heading back down is the most straining part of a mountain hike. 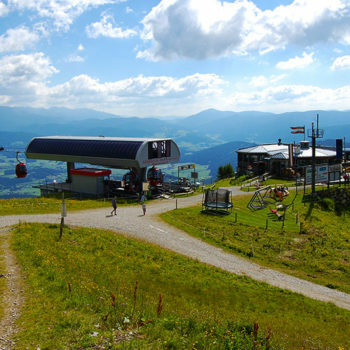 A couple of hundred of metres below the peak you descend on a ski slope. Even with a flat and grassy surface, your lower-leg muscles will feel the strain from walking downwards. Zigzagging for ease, I’m aiming for the two small lakes in the valley between Grosseck and Speiereck for the next break. The lakes are actually water resorvoirs for the snow cannons. Nevertheless, the turquoise ponds pleasent place to rest. 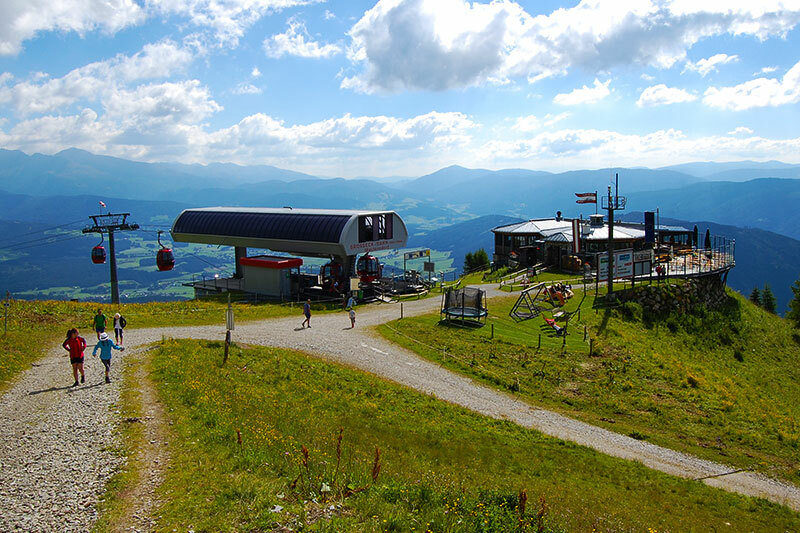 The last but well deserved stop was made at the Panorama Alm restaurant by the cable car station. Enjoying some hearty Austrian cuisine, in my case Kaiseerschmarrn, is an important part of any trip in the Alps and a great finish of the hike to Speierck. We stayed at youth hotel Mauser-Mühltaler in Mauterndorf, which has accommodation catering to adults as well. The friendly family run hotel provides very clean and neat rooms or apartments including breakfast for a reasonable price, right in the middle of the historical village. Mauterndorf has several eateries that serve everything from pizza to traditional Austrian cuisine. A couple of bars and a disco provides some after dinner fun as well. The village has a supermarket and deli as well if you want to stock up for a picnic or cook your own meals.